Sometimes you have to wonder how a product ever got to market, without being put out of its misery first. The HTC Monet (also known as the S320) which was sold in the UK as the Virgin Lobster 700TV is one of those examples. Surely somebody somewhere should have taken a look at the Monet and decided for the good of humanity that it should die. Sadly, they didn't. Take a look. It's a big, thick and plasticky monoblock phone with a large a inexplicable lump stuck on the on the side. There's a clue as to the purpose of this bulge with a button labelled "TV" stuck onto it. Here was the handset's unique selling proposition.. you could watch TV on it. If you dared to take it out of your pocket that is. Several handset manufacturers had tried to squeeze digital TV into their handsets at this point, notably Nokia with the N92. But almost all of these use the DVB-H standard (Digital Video Broadcasting - Handheld), derived from DVB-T (the "T" is for terrestrial) which is what you'll find in a normal digital TV. The HTC Monet used a variation of DAB, as used in digital radios, with a digital video stream piggy-backed onto the signal. This was called DAB IP. The advantage was meant to be that DAB was very widely available in 2006, where DVB-H certainly wasn't. In the UK there was some basic content available from the main terrestrial broadcasters, but not a lot of choice. And the Monet displayed all of this on a tiny 2.2" QVGA display. In portrait. Assuming you could receive anything at all. On one of the ugliest phones ever made. You can see that the unique selling proposition was looking a bit.. well, weak. The thing was.. it could have been so much better. Essentially the Monet was a Windows smartphone with some extra circuitry and software, so even by 2006 standards it could have been so much more. HTC had pioneered Windows touchscreen phones and a bigger display would certainly have been nice, but since the video was restricted to 240p resolution then it would never have been great. 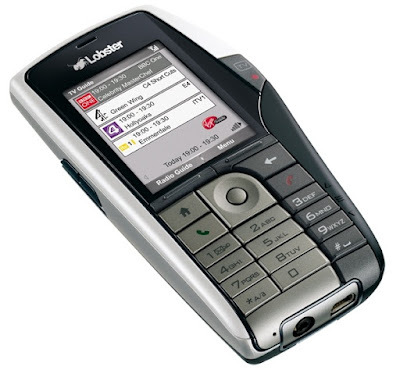 You won't be surprised to learn that the Monet was a flop, in the UK the Virgin handset ran on the BT Movio system which was canned in 2007. But it was more than a failure of a single product, the entire idea of watching broadcast TV on your phone was a failure too. DVB-H was trialled in many countries but never got any further and was switched off, DAB-based systems performed almost as badly although there was some success in South Korea. It's not that consumers were uninterested, but they wanted better phones, more choice and greater flexibility. Because it was never popular, this odd little phone is very rare today. Apparently it did make a very good DAB radio, although quite how well it functions with contemporary networks is questionable. If you are lucky.. or possibly unluky depending on your point of view, you might find one of these quirky devices for sale second hand.. if you look hard enough.